There are many opportunities for financial assistance. We recommend you search the internet and contact your schools, parish and community organizations for funds that are available. Thanks to the many supporters of the mission of Bourgade Catholic High School, there are several financial aid and scholarship opportunities available to those students who demonstrate a need. Some of those opportunities are described below. In addition, we recommend that you research additional sources of scholarship and financial assistance. Searching the internet and contacting your school, parish, or community organization for funds that might be available is a great way to find this aid. The Markham Family Scholarship is available to Bourgade Catholic students that have graduated from St. Gregory Elementary School and have demonstrated financial need. The scholarship is potentially renewable based upon continued financial need and satisfaction of the requirements listed on the application. In 1938, Fr. Patterson became the pastor of St. Mary's Catholic Church, which was then located in downtown Chandler. St. Mary's was a focal point for the Mexican population and Fr. Patterson promptly became involved with solving the problems that came with the young people of St. Mary’s parish having nothing to do and nowhere to go. He proceeded to organize sports clubs, religious organizations, outings, and drama programs. According to an Arizona Republic article written in 1941, three years after Fr. Patterson's arrival he had effectively solved the problem of delinquency among the Mexican children of Chandler. Fr. Patterson, a strong supporter of Catholic education, initiated the construction of St. Mary's Catholic Grade School in 1944. With its completion, St. Mary's offered an alternative to Winn School, a school set aside specifically for Hispanic students. All items listed on the checklist (cover page) must be included or the application will be considered incomplete. Student must write (or type) their own cover letter. Student must provide a separate list of extracurricular activities. A social security is required to receive a scholarship. If the student is not a U.S. citizen, evidence of a work or student visa is needed. Please do not send tax returns (unless requested after the application is reviewed). Applications must be postmarked by the due date. Recipients of the Christian Service Award display a love and understanding of their Catholic faith and articulate a commitment, not only to performing acts of service, but to living a service focused life. 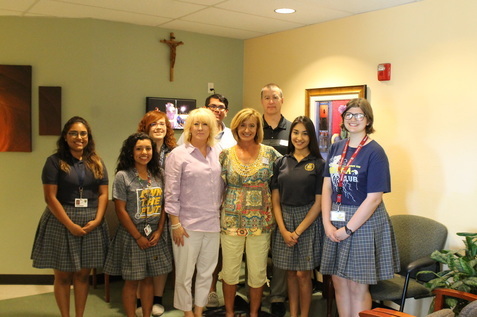 In 2014 the Catholic Community Foundation, through its generous benefactors, awarded 32 Christian Service Awards, to deserving students, totaling $256,000. This is 28 more awards than were available when the program first began, thanks to individual, family and organization sponsorship. Interest in the Awards has also grown for 2014. 124 eighth grade students completed applications for the $8,000, four-year Catholic high school tuition scholarships. Every student had the opportunity to interview with members of the Foundation's volunteer Christian Service Awards Committee. The Christian Service Awards committee took great care in reviewing the applications received, interviewing all of the applicants, and selecting the 32 recipients. There are currently fifteen students at Bourgade Catholic High School receiving this scholarship. Applications are available August of the students 8th grade year. For more information, click button on upper left column. For additional questions or information, contact the Bourgade Catholic Finance Office.